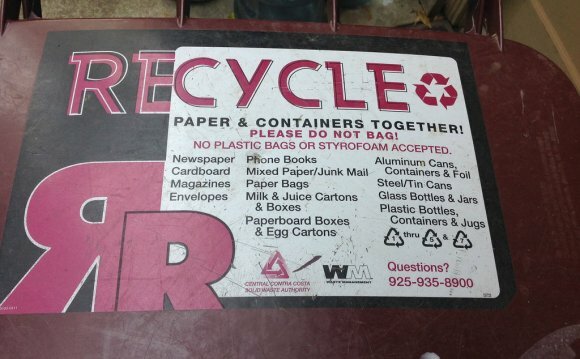 Place all recyclables mixed together into the recyclables container. Waste Management will take the mixed recyclables to the Waste Management Recycling Center for separation and processing. Bag-in-Bag: Place plastic bags and film plastics into a plastic bag and tie it closed. Place shredded paper in a clear, plastic bag and tie closed to keep it from flying around. All other recyclables can be left loose in the cart or bin, and do not need to be bagged. Empty and scrape out or rinse containers. No need to wash them or remove labels. No need to remove envelope windows, staples, or paperclips from paper. All items must fit into the recyclables container. Hazardous Waste: Electronics, all batteries, fluorescent lighting, paint, fertilizers, herbicides and insecticides are prohibited in landfills. See your area’s page for disposal locations. Our staff members will be sorting and handling your recyclables at the recycling processing facility. Please keep their safety in mind. You can recycle plastic bags and plastic stretch and bubble wrap by placing materials in a single plastic bag, self-tie the bundle, and place it in the recyclables container. Do not use twist ties, rubber bands or tape. Do not throw single plastic bags in cart. You can recycle one (1) oil jug and/or one (1) oil filter bag per week. For free oil jugs and oil filter bags, call Waste Management at (800) 321-8226. Place oil in the one-gallon screw-top containers and the filter in the attached bag. Set them out beside your recycling cart on your regularly scheduled pick up day.